I asked my husband exactly what kind of hat he wanted me to knit for him using the Rowan Silky Tweed from our San Francisco trip. 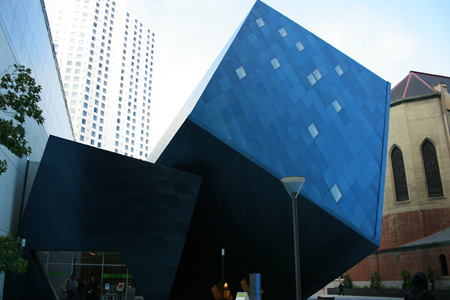 He answered, “Something with diamonds.” I think he was inspired by the breathtaking Contemporary Jewish Museum, designed by Daniel Libeskind, which we visited during this trip. Naturally, this led me to think of another architect, and another structure with diamond motifs: the Central branch of the Seattle Public Library, designed by Rem Koolhaas. Conveniently, this building comes with its own hat pattern, which my husband liked ;). 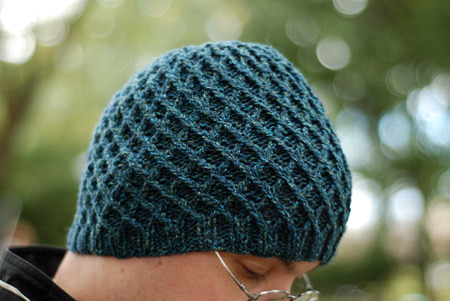 Pattern: Koolhaas Hat by Jared Flood, available at the Interweave Store. Yarn: Rowan Silky Tweed, 80% lambswool, 20% silk, 137 yards per 50 gram skein, color #753. I used 1 full skein, plus a few yards of the second one. The remainder of that second skein almost became a porcupine tragedy, but more about that later. Needles: As recommended, US 6 and US 8 circs, some simple ones by Susan Bates . 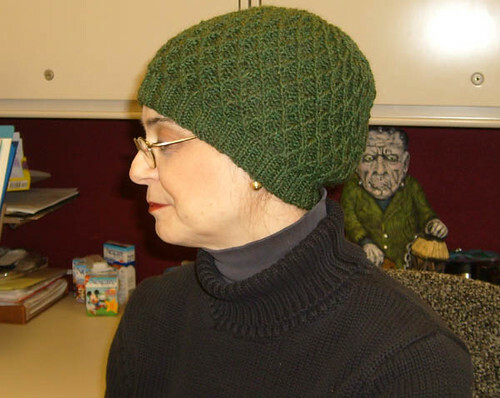 In fact, I knit the entire hat as recommended, with zero modifications (this is the men’s size – 5 repeats of the pattern). It came out perfect! Libeskind, Koolhaas, but who’s the third architect? Mr. Sweetness, of course! That’s a lovely hat. It has been in my queue forever! Oh I love the koolhaas in tweed! And you crack me up with the Mr Sweetness thing. 🙂 You two are just too cute. i’m gonna have to try that yarn – your hat is lovely! Really a fun knit, I thought. Cool hat; I love Susan Bates circular needles better than addis! Mr. and his Koolhaas work well together. So do Mr. and Mrs. Sweetness. It IS a fun knit, I made one for my daughter, and I like the tweed, I may have to do another! God how is it that a Rowan junkie such as myself has never heard of Silky Tweed? This is insane. Lovely depth of color! Looks like the hat is doing a great job of keeping your husbands ears nice and toasty. Really like that hat in the silky tweed yarn. The colour is wonderful too! Wow! I had not idea that the hat was named after someone, I just thought it was a clever play on pronunciation. Thanks for sharing that! Yours turned out very nice, what a great color choice. This hat is the perfect hat for a man! I have knit it for both my husband and my brother in-law. Both of them love the pattern. My husband was a school bus driver for middle school kids. When he debuted his new hat he got many compliments on his new cool hat. You know something is cool when teenagers think it is cool! Great architecture & grear knitting! A sure winner! Koolhaas looks great n that yarn. Gret way to tie it all together. It’s a perfect hat in so many ways for him! I’m going to need to knit myself another Koolhaas this year. I love how yours came out with the silky tweed. My yarn had a little too much of a halo and the beauty of the pattern was somewhat diminished. 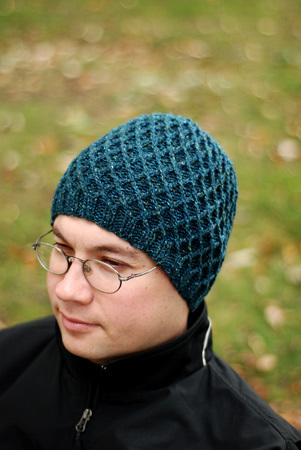 Looks great on Mr. Sweetness, a lovely rich blue-green color and shows off the soft but nubbly texture of the wool.